Aerospace Engineering/ISR Associate Professor Derek Paley and Mechanical Engineering/ISR Assistant Professor Sarah Bergbreiter at the White House. Photo courtesy of Sarah Bergbreiter. 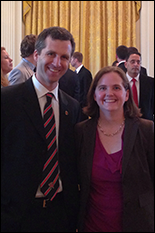 Mechanical Engineering Assistant Professor Sarah Bergbreiter and Aerospace Engineering Associate Professor Derek Paley, who both hold joint appointments with the Institute for Systems Research, were honored at a White House Ceremony, April 14, 2014, as recipients of the Presidential Early Career Award for Scientists and Engineers (PECASE). The PECASE is the highest honor bestowed by the United States Government on science and engineering professionals in the early stages of their independent research careers. Bergbreiter, whose PECASE nomination was sponsored by the National Science Foundation, is the director of the University of Maryland Microrobotics Laboratory and performs research aimed at bridging work in systems and control with research in microsystems and fabrication. She is fast becoming one of the leading researchers in the field of microrobotics. In 2013, she was named one of the top "25 women in robotics you need to know about" by Robohub and she envisions creating networks of tiny robots that can operate cooperatively to perform a variety of functions—from assembly tasks to sensor deployment—like an army of robotic ants. Her work on microrobotic locomotion has also earned her a 2011 National Science Foundation (NSF) Faculty Early Career Development (CAREER) award. Paley's PECASE nomination was sponsored by the Department of Defense, and most of his research—dynamics and control, cooperative control of autonomous vehicles, adaptive sampling with mobile networks and spatial modeling of biological groups—is based on support from the U.S. Army, the Office of Naval Research (ONR) and the National Science Foundation. Paley is the founding director of the University of Maryland's Collective Dynamics and Control Laboratory and the Willis H. Young Jr. Associate Professor of Aerospace Engineering Education, and he was awarded a National Science Foundation CAREER award in 2010. According to a White House press release, "PECASE awardees are selected for their pursuit of innovative research at the frontiers of science and technology and their commitment to community service as demonstrated through scientific leadership, public education, or community outreach. The winners represent outstanding examples of American creativity across a diverse span of issues—from adding to our understanding of the most potent contributors to climate change to unlocking secrets to some of the most pressing medical challenges of our time to mentoring students and conducting academic outreach to increase minority representation in science fields."